Visitors can sample spirits and buy bottles at the new tasting room. 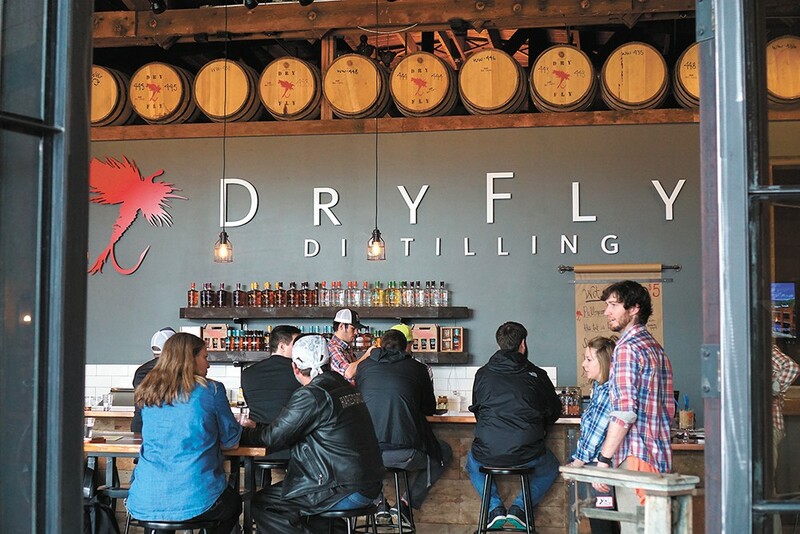 Dry Fly Distilling has long kept a small tasting bar next to its distilling equipment, but when a coffee shop next door moved out recently, its owners saw an opportunity to build something better. "For years we had such a small tasting area, and we wanted to offer an area that people would enjoy more," says Dry Fly co-founder Kent Fleischmann. So he and co-founder Don Poffenroth hired an architect and a construction company to turn the space into a bright, open-floored tasting room. The distillery's team also did plenty of work on the space themselves. With seating for 50 people at tables and a long bar, the Dry Fly crew hope people stay and hang out in the new space like they would at a bar or restaurant. Fleischmann says their Washington distillery license allows them to serve up to 2 ounces of spirits per person, per day. In the new tasting space, they plan to offer one-third-ounce samples of three different spirits of the customer's choice in a tasting flight ($5). There's also a rotating cocktail menu featuring Dry Fly's vodka, gin, barrel-aged gin, and its long lineup of whiskeys, paired with fresh ingredients when called for. Occasionally, private barrel tastings of yet-to-be-released products may also be available. In addition, the tasting room is serving small bites to pair with the spirits. Customers can also purchase bottles of their favorite spirits to take home. The new space features refurbished wood salvaged during construction. Some of the trim wood is from Colfax-area farmer Tim Danaher's barn. Danaher grows the barley and oats for the private label O'Danagher's Hibernian Whiskey, which Dry Fly distills for him. Whiskey barrels line the top of the room's east wall, where windows allow guests to peer into a large barrel storage area. Dry Fly's spirits are made just on the other side of the north wall; opposite that are glass displays of the grains and botanicals used to make their products. Periodically, Dry Fly plans to host a new event at the tasting room called "Cocktail College," which Fleischmann says will "enhance people's understanding of how liquor is made and how good cocktails can be made."